Evening core classes for the USC Marshall Part-Time MBA Program, also known as the MBA for Professionals or Managers, are held between 6 p.m. and 9:40 p.m (MBA.PM) twice a week. The first year core courses can be taken at the Los Angeles University Park campus on Monday and Wednesday evenings or at the Orange County campus on Tuesday and Thursday evenings. Students have the option of taking the first year core classes on Saturdays at our Los Angeles University Park campus. These classes will meet Saturdays from approximately 9 a.m. to 5 p.m. The program can be completed in 33 months. Marshall offers one intake per year, and classes begin during the fall semester. The USC Marshall Part-Time MBA is a 63-credit program comprising a core curriculum of 31.5 credits and 31.5 elective credits. The core courses are Strategic Formulations for Competitive Advantage, Financial Accounting, Communications, Microeconomics, Statistics, Org Behavior, Info Systems, Corporate Finance, Marketing, Macroeconomics, Strategy, Managerial Acct, and Operations Management. Following the 12-month core experience, all MBA.PM students take PM.GLOBE, a semester-long macroeconomics course enhanced by a 10-day overseas trip. Marshall offers close to 100 elective courses for MBA students in any given year. Second-year electives are offered at various times throughout the day and evening. Students generally select a primary concentration in a functional discipline — such as marketing or finance — and a secondary concentration (an industry “vertical”) that is related to a specific job focus, such as healthcare or real estate. The typical USC Marshall Part-Time MBA class is 68 percent male and 32 percent female. Students in the class have an average GPA of 3.2 and an average GMAT score of 620, with an average of six years of work experience. The average age of matriculating students is 28. A total of 156 students are currently enrolled in the class of 2017. USC Marshall’s year-round learning and networking programs will introduce you to some of the world’s most influential companies. Working with students to identify an industry and career area focus, the school of business offers specialized guidance as students choose courses and pursue a summer internship. By taking advantage of the full range of vital services — including one-on-one career advising, career management workshops and interview coaching — students will be able to pursue your first post-MBA job with confidence. 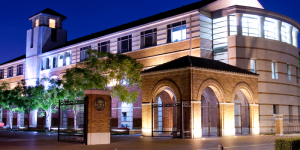 The approximate overall cost of the USC Marshall part-time MBA program is $120,000. Roughly half the overall costs are incurred in the first year of the program. Costs cover tuition, textbooks, classroom materials, parking, university fees, and required lodging costs for the MBA.PM GLOBE residential. Additional costs for the MBA.PM GLOBE residential including some meal costs will be the responsibility of the student. Tuition per unit is $1,778. Tuition rates are also subject to rise 3-to-5 percent percent every year. Marshall does not offer scholarships or fellowships for any students in our fully employed programs, including the USC Marshall Part-Time MBA (MBA.PM) program. However, many employers participate in tuition assistance programs and there are a number of additional loan options available for USC Marshall MBA.PM students. Three types of loans are available to finance the MBA — Federal Stafford Loans, Federal Direct Graduate PLUS Loans and private student loans. It is recommended that U.S. citizens or permanent residents apply for Federal Stafford Loans first, because they offer favorable interest rates and origination fees. International students are not eligible for this loan program. Applicants to the Marshall School part-time MBA program must have a four-year undergraduate degree, or equivalent. To apply to the Part-Time MBA program, applicants must submit a completed application form, all college transcripts from degree-granting and non-degree-granting institutions, a current résumé and two letters of recommendation. The school also requires applicants to complete one essay about their leadership experiences and goals; applicants may also submit an optional essay for any additional information you wish to convey to the Admissions Committee. Applicants must also send in their GMAT or GRE scores (GMAT preferred) and a nonrefundable $150 application fee. International applicants must submit scores for the TOEFL or IELTS. Tests must have been taken on or after August 1, 2014. The USC Marshall part-time MBA employs a rolling admission system. Application forms are reviewed as soon as an application file is complete, beginning in September. Applicants are encouraged to apply as early as possible.